The App Store metrics as at November 6, puts iOS 11 as now installed on 52 percent of active iPhone and iPad worldwide. 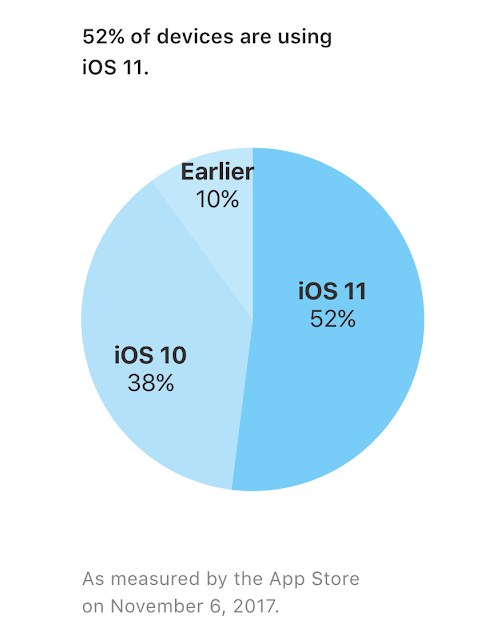 While 38 percent of devices still run iOS 10, with only 10 percent using an earlier version of the software. Apple had delayed updating the App Store support page, which formerly update follows immediately after the release of a new iOS version, even with launch of the iPhone X last week, notwithstanding. Albeit, the company reported roughly about the same figure last year with 54 percent of users running iOS 10. Emojis remain the main attraction with new iOS update, as most users don’t want to be left out of the fun. Apple added new emojis as part of iOS 11.1, which is equally true for iOS 10.0 with new emojis. While emojis have become such an evolving part of the funky culture, and many users want to be able to enjoy it all and not just having regular marks for missing characters. Apple is close to releasing iOS 11.2, which will arrive with Apple Pay Cash - Apple's peer-to-peer (P2P) payment in beta, allowing to send and receive cash in Messages for U.S. customers.